As the final weekend of the Rio 2016 Summer Olympics kicked off, an abundance of the most prestigious 6 grams of gold in sport were up for grabs - and one special athlete would go on to complete a historic "triple triple" with them. That of course, was the fastest man on the planet, Usain Bolt, who stormed to victory with his Jamaican teammates in the final of the 4x100m relay, which was at the end of a day full of historic finals. Here, we round up all the medal action from the fourteenth day of the games. The USA would storm the women's 4x100m relay, however the men would be disqualified after their podium finish, for a very close call on a baton transfer. 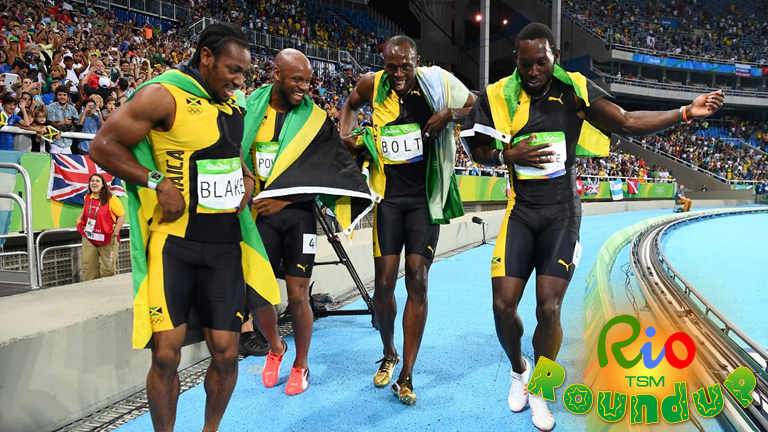 Usain Bolt lead Jamaica to a strong victory in the men's relay, finishing off the 100m in blistering fashion to complete the historic triple triple. Vivian Jepkemoi Cheruiyot prevailed over the fading Almaz Ayana to win the 5000m crown. On the field, Dilshod Nazarov won the men's hammer throw while Ekaterini Stefandi cleared 4.85m to win the pole vault. Chong Wei Lee booked his spot in the men's singles final after a thrilling victory over Dan Lin, before Long Chen cruised past Viktor Axelsen to set up a China vs. Malaysia battle for the gold medal. Carolina Marin ended the surprise run of India's P.V. Sindhu as the Spaniard topped her over the course of three hard-fought sets, where both athletes were pushed to the brink. Marin would take the gold medal with a victory of 2 sets to 1, while the contest for bronze wasn't a contest at all - as Nozomi Okuhara was awarded the prize due to the withdrawal of her opponent. China's pairing of Haifeng Fu and Nan Zhang claimed the gold medal in the final of the doubles, as they defeated Malaysia's V Sheem Goh and Wee Kiong Tan in a final that went down to the wire. After dropping the first game, they came out with a renewed sense of urgency to win the second game, before digging deeper into their reserves to save two match points, then smash it towards the feet of their opponents - wrapping up the tournament and being crowned Olympic champions. Klay Thompson finally got his scoring going as the United States progressed to the final of the men's tournament, seeing off Spain with an 82-76 victory. Scoring their lowest of the Olympics, the Americans didn't come across as much trouble as seemed, ever so close to retaining the gold medal which people thought was inevitable. Serbia stunned Australia in the second semi-final to book their spot against the Americans with a shot at gold, as the Boomers crumbled under the pressure to an 87-61 defeat. Britain's Joe Joyce stormed into the final of the men's super heavyweight competition with yet another strong win, this time dispatching Ivan Dychko to set up a gold medal bout against France's Tony Victor James Yoka. Throughout the day, other boxing finals were set. In the flyweight, Zoirov will face Aloain, while the light welterweight will feature Gaibnazarov and Collazo. The women's middleweight gold medal contest will pit Fontijn against Shields. Estelle Mossely overcame an early deficit to win a gold medal and the ultimate birthday gift, topping the women's lightweight bracket with a split decision win over Yin Junhua. Reigning world champion Mariana Pajon added a gold medal to her list of accolades in the women's BMX final. With the South Americans willing her on, Pajon was able to fend off the opposition brought to the table by American Alise Post. In the men's final, Connor Fields handed the USA their first ever BMX gold, timing 34.642 as he defeated the nearest opposition by half a second. 58-year-old Nick Skelton secured the gold medal in the individual show jumping as Great Britain won another equestrian medal. A six-way jump off was all decided in favour of the Brit when opponent Eric Lamaze clipped the fence resulting in a crucial penalty. Brazil's women finished without a medal in the football as they went from their crushing penalty loss to Sweden by slipping to Canada, after goals from Rose and Sinclair proved the difference. Winning one of the most prestigious titles in women's football were the Germans, as they thwarted a late Sweden surge. Linda Sembrant turned a free-kick into her own net, in what would end up being the goal that decided the ate of the gold medal in the Maracana. 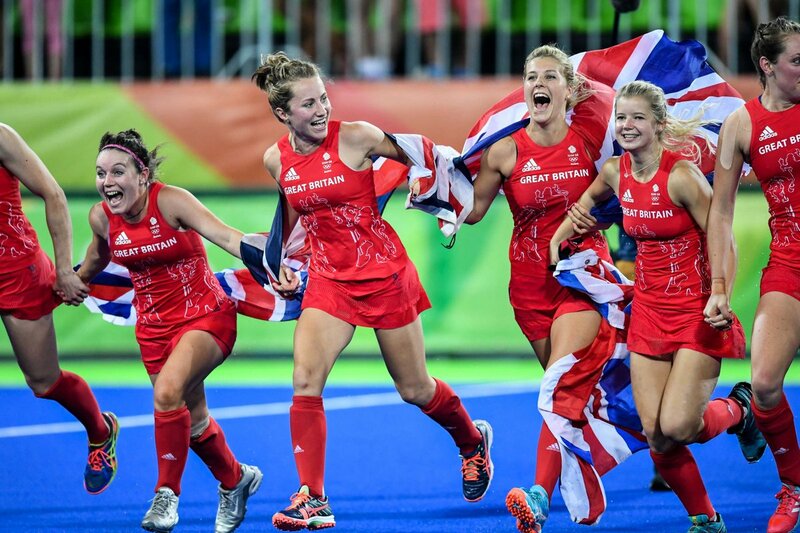 Great Britain's women fought back against the reigning Olympic champions Netherlands to force a penalty shootout and subsequently seize the gold in thrilling fashion. In the final of the women's competition, a 3-3 draw after regulation forced overtime, in which Brit keeper Hinch saved all the Dutch penalties, meaning that Richardson-Walsh and Webb's successful conversions would crown their team the champions. Prior to that, Germany edged New Zealand to win the bronze medal. Their place on the podium was reserved after a solid performance in the third quarter where they scored both their goals. Vladimer Khinchegashvili of Georgia edged Japan's Rei Higuchi in the 57 kg freestyle, while Hassan Aliazam Yazdanicharati won a gold for Iran in the 74 kg category. Chloe Esposito proved she was the most skilled woman at the games, with an overrall of 1372 in the modern pentathlon. Russia's team totalled a whopping 196.1439 - over 3 points clear of the Chinese, to win the top prize in the team synchronised swimming event. The United States pulled off a huge 12-5 victory in the final of the women's water polo. Great Britain's Latolo Muhammad lost out on a gold medal after a head kick by his opponent in the final second of their bout. Note: Still to be updated.